We recently released a feature that allows content creators to link their ANGEL course section to a website hosted on Sites at Penn State. This eases some of the burden of site management by automatically adding students as a specified role to a course site. The following is not yet released to all courses in ANGEL; however if you are interested in adding this to your ANGEL course and participating in this pilot let us know by filling out the form at the end of this post. Add Content menu in ANGEL. Click External Tool to start. 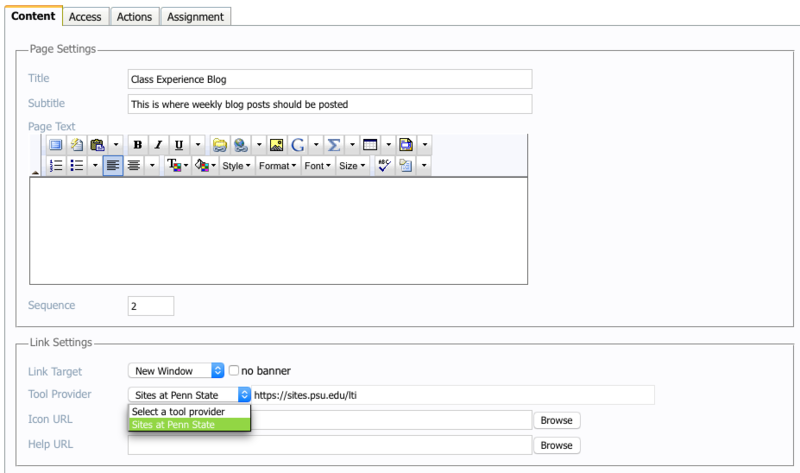 In the Add External Tool interface, enter the title (and optionally, the sub-title) of the link to your Sites at Penn State as it will in the ANGEL Lessons tab. In the Link Settings area, choose “Sites at Penn State” as the Tool provider. You may also want to change the Link Target option to also open in a new window and without the ANGEL banner. Add External Tool form. Select “Sites at Penn State” in the Tool Provider dropdown. After clicking Save you now have a link in the lessons area. Click on it to open Sites at Penn State and begin setting up your course site. Newly created link in ANGEL Lessons tab. Click to begin setup. When first launching this link to Sites at Penn State, you are asked for some optional course information: Course Title, Course Number, and Campus. Course information form. 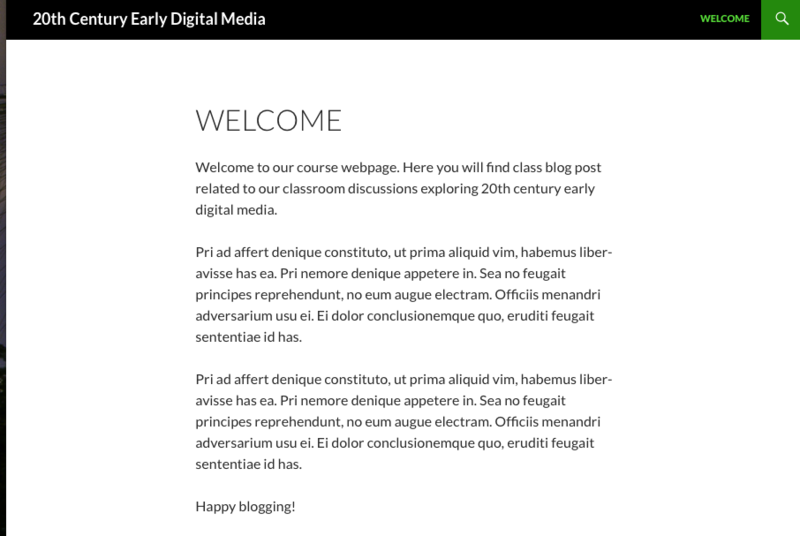 Optionally enter course information. On the next step, you are able to set which role students entering the site via ANGEL will be assigned. Choose author or contributor if you would like students to be able to add blog posts to the site; otherwise choose Subscriber to add as an unprivileged user. Student role setting form. Select student’s role in your site. On the next step you have the option to either create a brand new site or assign an existing site to the ANGEL resource. Choosing an existing site means you already have a site created on Sites at Penn State that you want to be associated with this ANGEL link. Option to create new site or assign existing site you’ve already created. When creating a new site you choose the address of the site and enter the site’s title. These are pre-filled based on the ANGEL course name but can be modified. You may optionally choose to restrict access so that only members can view its content. Creating new site form. Enter the new site’s URL and title. 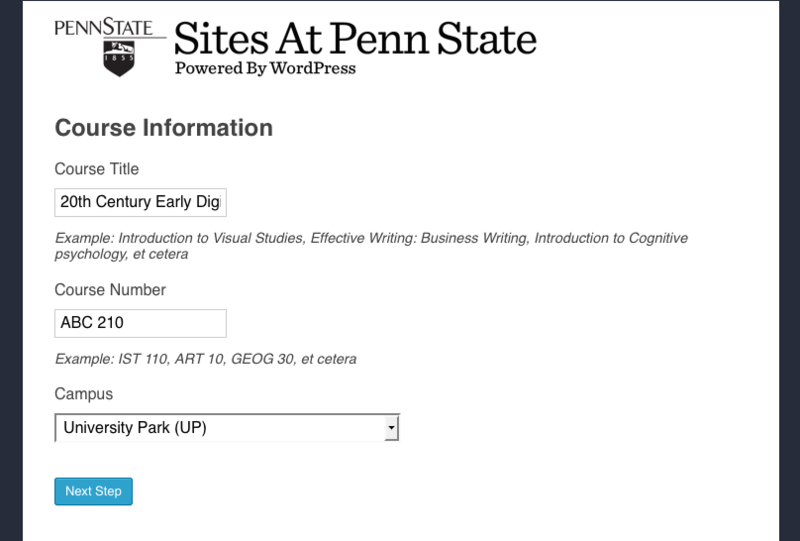 If assigning an existing site, you have the option to choose from any site of your sites on Sites at Penn State. Only sites to which you have Administrator level access are available on this form. Assign an existing site dropdown menu. Select one of your sites to assign. Once clicking “Create Site” or “Save Course Information” you are redirected to a confirmation page. Confirmation message. The site is now assigned. Redirected to course homepage after clicking link in ANGEL. Just to clarify. Is this creating more of a special link to Sites from ANGEL that automatically adds students to the Sites roster? Or is it an actual synching of the Sites roster to the ANGEL roster? Seems an important distinction since the former method would allow students who subsequently drop a class to continue to access a closed Site, though they’ll be locked out of ANGEL. Your first description of the of link is correct. This does not allow actual syncing of the course roster, so anyone subsequently dropping the class would still need to be removed from the site on Sites at Penn State. Syncing of a course roster has been discussed but we are unsure when this feature will be made available from ANGEL.